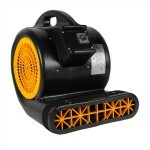 This Shop-Vac portable wood shop air cleaner is perfect for any hobbyist that has a home work shop, or for the professional on the go. This air cleaner has a two-stage filtration system that can recycle the air in a 17' x 17' room, 10 times per hour. This unit is also great for cleaning around small machines in larger shops. It conveniently fits right by a drill press, planer, or sander to help ingest some of that excess particulate that can get thrown up into the air and inhaled. Also has proven to be effective in small dry wall jobs like cutting in electrical and light switch boxes. This unit can also be mounted on a ceiling, work bench, or wall to be a permanent fixture in your shop. Shop-Vac makes sure to supply you with the proper filtration, as this portable air cleaner comes with a cartridge filter and a foam sleeve. Please Note: This air cleaner does not produce ozone, it is only an air cleaner. For more options in the air cleaning division, including ozone producing machines, please take a look at our full line of air scrubbers/cleaners. Great for the small wood shop to help clean air and keep harmful particulates, including saw dust, out of the air. Can be permanently mounted to the ceiling, work bench, or wall. Can recycle the air in 17' x 17' room 10 times per hour. Quiet sound operation level makes you forget it's even there and running. A great way to protect your health without destroying your budget. This is a review for the Portable Wood Shop Air Cleaner.